Written on 29 June 2017. EDHEC announced this May that it had joined Station F, the world’s biggest start-up campus, located in the heart of Paris and set up on the initiative of Xavier Niel. The inauguration marks the launch of this wide-ranging project which steps up EDHEC’s engagement with entrepreneurship. 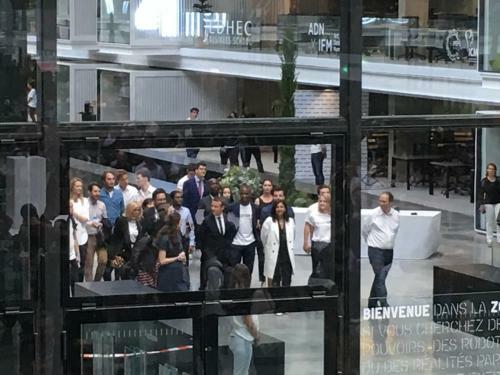 Emmanuel Macron, President of France, attended the inauguration of Station F on Thursday 29 June, in the presence of EDHEC Business School and other partners. The project received decisive support from EDHEC alumni donors and bolsters the resources of the EDHEC Young Entrepreneurs (EYE) incubator. 1 July 2017 sees the EDHEC Young Entrepreneurs (EYE) incubator expand through the provision of 40 additional work stations housed in Station F, the only start-up campus that gathers together a whole entrepreneurial ecosystem under one roof. This co-working space will be devoted to EYE laureates in the acceleration and/or fundraising stages and to entrepreneurs originating from EDHEC’s MSc in Entrepreneurship & Innovation. The programme comprises themed workshops, personalised support (fundraisings), pitch sessions, entrepreneurs’ cafés, co-design workshops and more. EYE offers free support to students and graduates of EDHEC Business School eager to create their own start-ups by harnessing the training received at the School and projecting its values of excellence. Since its foundation in 2010, EYE has supported 140 start-ups that have generated 850 jobs overall. The incubator conducts over 400 exploratory interviews and validates some 30 “laureate” projects each year.